President Donald Trump speaks at Fort Myer in Arlington, Virginia, Aug. 21, 2017, during a presidential address on U.S.-Afghanistan strategy. Tuesday marks one year since U.S. President Donald Trump unveiled his South Asia strategy with a focus on Afghanistan. Since then, Afghanistan has seen some of the worst violence since the U.S.-led invasion almost 17 years ago. 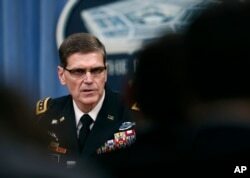 Gen. Joseph Votel speaks during a news conference with Defense Secretary Jim Mattis at the Pentagon, April 11, 2017. 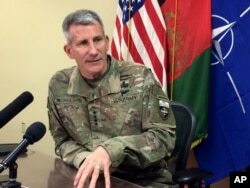 FILE - Gen. John Nicholson, the top American commander in Afghanistan, speaks to reporters, March 14, 2018, at Bagram air base north of Kabul, Afghanistan. In the midst of vicious multipronged attacks by the Taliban across Afghanistan in recent weeks, American businessman Erik Prince's plan to privatize the U.S. war in Afghanistan is reportedly receiving renewed traction within the Trump administration. VOA's Madeeha Anwar and William Gallo contributed to this report from Washington.